For patients who haven’t been to a chiropractor in Dallas before, they’ll quickly learn that one of the most popular treatment options is cold laser therapy. Not only is cold laser therapy highly effective and noninvasive, it can also be completed in as little as 10 minutes! This is a perfect treatment option for people suffering from a variety of injuries. The treatment, also known as Low Level Laser Therapy involves using visible infrared light at a specific wave length to cause molecular vibrations in the body. Patients will experience a mild warm feeling where the light is being applied. The photons are absorbed by cells in the designated target area, which increases the production of cellular energy and in turn results in a higher-quality recovery. The treatment is performed with a handheld cold laser therapy device, approximately the size of a flashlight. Once the area of injury has been determined, we then place the laser over the area for a time span of 30 seconds to a few minutes. The length of exposure is directly related to the size of the affected area on the patient’s body. Since cold laser therapy is such a versatile procedure, it is used to treat a variety of ailments all over the body, such as fibromyalgia. 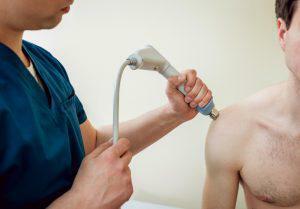 Cold laser therapy is a relatively new method for relieving pain in the spine. The talented staff at Premier Health Chiropractic is dedicated to learning the most up-to-date processes in order to provide the best care for our patients. If you are experiencing symptoms that could be helped through cold laser treatment, or just have questions about your pain, get in touch with us today to schedule your free consultation with an experienced Dallas Chiropractor.